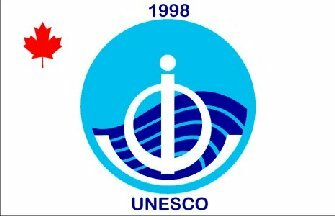 The 1998 International Year of the Ocean (IYO) Flag (Canadian version) that was worn on all Canadian Coast Guard Ships in 1998. On the ensign used during the International Year of the Ocean, the flags were in two sizes: 27 X 54 inches and 18 X 36 inches. Vessel types 400 and larger received 4 large flags; other vessels received 3 small flags. The flag was flown when the ship was underway or during the hours of 0800 and sunset when moored. The IYO flag was to be worn on the starboard yardarm or equivalent, and when an Flag of Office was worn, it took precedence over the IYO flag. The IYO flag was not to be larger than the Flag of Office. The IYO flag was not to be half-masted.